Portsmouth-based author J.J. Hebert decided to start his own consulting and independent publishing business after learning from the experience of publishing his first book. Working with an editor in the Lakes Region on his drafts for “Unconventional,” an inspirational novel with Christian themes, Hebert landed an agent and attempted the conventional publishing path. The book was shopped around to different publishers, but he found their guidelines for the genre were too stringent, and settled on self-publishing as the best route. He found a printer with a facility in Pennsylvania and started marketing the book online, mainly through social media and paid online ads. “Unconventional” sold over 100,000 copies and was listed on Amazon’s Best Sellers List. That was in 2009, and Hebert’s national self-publishing business, MindStir Media, was born. To expand the business, Hebert hired editors and illustrators he personally vetted. From 2009 to 2012, MindStir Media experienced significant growth, says Hebert. 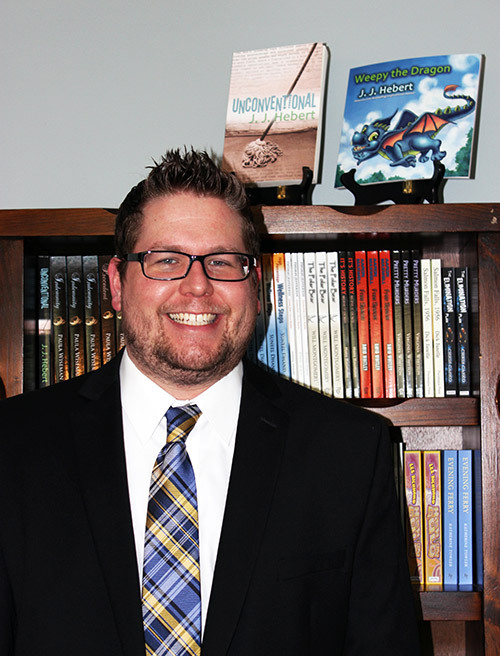 It has published 400 titles to date in nearly every genre and is working on 60 to 80 titles at a time, focusing on hardcover and softcover print copies as well as an e-book counterpart. This year, Hebert launched his New Hampshire-focused self-publishing company, Seacoast Press. He says children’s books experience the lowest e-book sales because parents still want their children to have the physical connection with a book. “We’ve found print is very much alive. I think there was a huge spike [in e-books] in 2010 with [the advent of] Kindles. But we’ve seen print books right up there with e-book sales in 2016,” says Hebert. According to the Association of American Publishers, in 2014 e-books made up 21 percent of the market, while hardcover, paperback and board books (used for some children’s books) make up 65 percent of the market. (The rest of the market is different audio formats). “Within the self-publishing world, e-books are certainly something you should not overlook. And I give the advice to authors, you shouldn’t put your eggs all in one basket, in terms of book format,” says Hebert. Southern Illinois inspirational author Paula Wiseman started working with Hebert in late 2009 on her book, “Contingency,” the first book in a series about a woman’s struggle with knowledge of her husband’s infidelity. Wiseman worked as a chemist for several years before becoming a stay-at-home mom, writing in her free time. She met Hebert online. “When I had my first manuscript, I submitted it to [Hebert] for a critique, and when I got his report back it was very positive so that kind of led to ‘tell me more about your publishing company’ because his was the first positive response I got to the manuscript,” she says. A traditional publisher, as Hebert and Wiseman explain, will offer an advance or sign-on bonus, giving the author 10 to 15 percent of the expected royalties, which he or she then shares with the agent. Once the publisher recoups that money in sales, the author can earn additional royalties, however those that can be as little as 50 cents a book sales, says Hebert. And often, authors sell away the rights to their book. “With what we offer, we handle all the grunt work, so we’re full-service, but we allow the author to keep their publishing rights so they’re not selling their publishing rights to the publisher who will change the content and pay a small royalty,” says Hebert. Wiseman has since published eight books with MindStir Media, corresponding with Hebert via email and over the phone. For example, Wiseman says she and Hebert have learned how to better hone their pre-release process by getting promotional artwork early to tease the book online. “Marketing is a really steep learning curve, and it’s one of those things you kind of learn as you go, learning to find who your audience really is and what the best way to connect with them is. That takes some trial and error,” says Wiseman. Different audiences also have different preferred formats. “The first two novels we [made into] audio books also, and they were not a good fit with my readers,” says Wiseman, who acknowledged the format works for business books and other genres. But she found success in the uptick of Kindle sales. By April 2011, she had already published her second book in the “Covenant of Trust” series, and saw an increase in sales on Mother’s Day 2011.